In the 1880 census, Jacob was born in Pennsylvania and 5 years old, living with his parents and 7 siblings in Lehman, Luzerne, Pennsylvania. 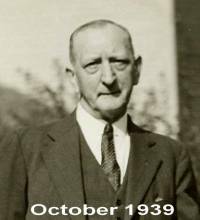 He was a Laborer in 1898, worked for the Hazard Wire and Rope Company in Wilkes-Barre, Pennsylvania. In the 1900 census, Jacob was 25 years old, born in Nov 1874. Both his parents were born in Germany. He was married 1 year to Matilda. He worked as a day laborer. He rented a house at 38 Hutson Street, Wilkes-Barre, Pennsylvania. He was living with his wife and sister-in-law, (?? Lena) Esler. In the 1910 census, Jacob was 35 years old and born in Pennsylvania. His father was born in Pennsylvania and mother's birth place was unknown. He was married 12 years. He worked as a Foreman in a Rope Works. He lived with his wife and 6 children at 265 South State Street, Wilkes-Barre, Pennsylvania. In 1913, the family was living at 248 S. Washington Street, Wilkes-Barre, Pennsylvania. World War I Draft Registration Card, 12 Apr 1918: Jacob Homan Walter was born on 18 Nov 1874. He lived at 190 Park Ave., Wilkes-Barre, Pennsylvania. 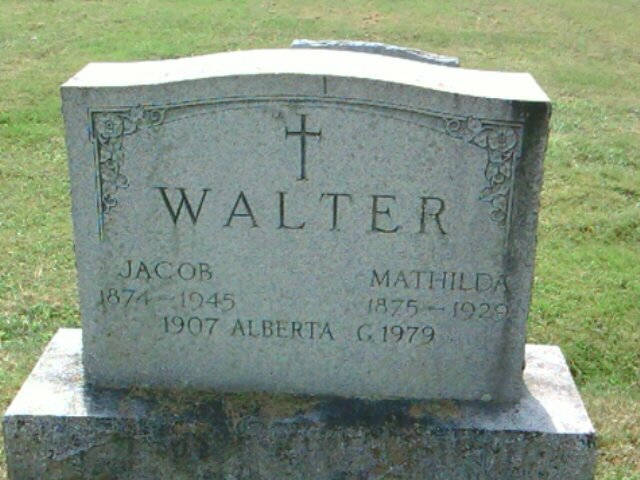 His nearest relative was his wife, Mathilda Walter. He was medium height and slender build. He had gray eyes and light hair. There were no physical disabilities. He was a foreman at Hazard Manufacturing Company, Wilkes-Barre, Pennsylvania. In the 1920 census, Jacob was 45 years old, born in Pennsylvania, His father was born in Germany and his mother was born in Ohio. The family was renting a house at 190 Park Ave, Wilkes-Barre, Pennsylvania. Living at home were his wife, 10 children and mother-in-law, Elizabeth Schappert, 75 years old. Jacob was working as an assistant foreman in a Wire Mill. In the 1930 census, Jacob was 55 years old. His father was born in Germany and his mother in Ohio. He was a widowed and working as a foreman in the Wire Rope industry. He owned his home at 97 Elizabeth Street, Wilkes-Barre, Pennsylvania. He lived there with his 8 children. Jacob suffered from Chronic Interstitial Nephritis. He died on 14 Aug 1945 in Wilkes-Barre, Pennsylvania. He was buried in St. Nicholas Cemetery, Shavertown, Pennsylvania.